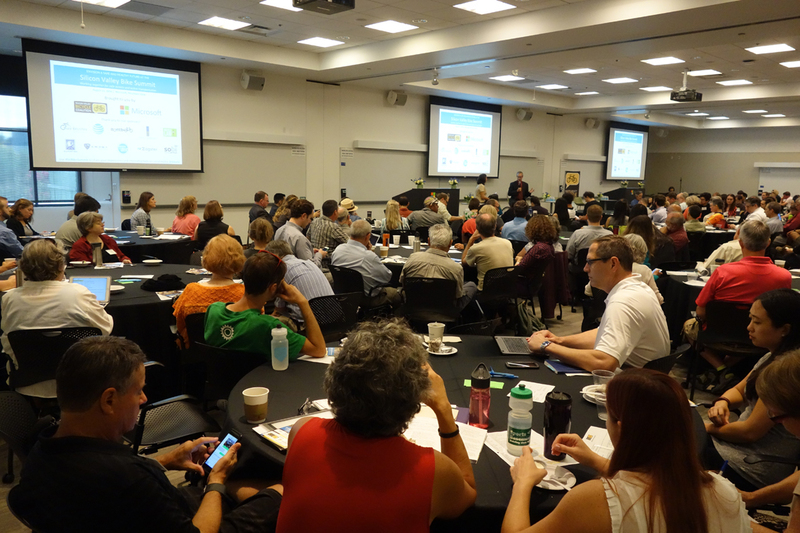 SVBC and its sponsors hosted a bike summit in Mountain View. At the sixth annual Silicon Valley Bike Summit hosted by the Silicon Valley Bicycle Coalition (SVBC) on Thursday, Aug. 11, dozens of government transportation leaders turned out, and that’s a sign of good things to come. SVBC Executive Director Shiloh Ballard opened the meeting by acknowledging those city council members and other important government officials attending. Before I report on the day’s activities, in the coming weeks, let’s look at where Bay Area cycling advocacy has been in the past 30 years. In the 1980s, bicycle advocacy was in its infancy. Few public officials gave much credence to bike transportation as a viable alternative to cars. That’s one reason why the late Ellen Fletcher, three-term Palo Alto city council member, became such a celebrity among cyclists. She was an elected official who rode a bike and worked tirelessly to bring cycling to the table on equal footing with the automobile. Back then the focus was on winning access to expressways, allowing bikes on Caltrain and building more bike lanes. I don’t know all the details of how SVBC got started, but its original all-volunteer membership maintained a newsletter, Spinning Crank, for two decades starting around 1986. SVBC has seen slow but steady growth, now at some 2,200 paid members. The SVBC evolved into a non-profit with a paid staff and volunteers, working on a tight budget. It’s more tied in than ever to local governments, trying to improve all aspects of bicycling. The bike summit is one of its many advocacy gatherings held throughout the year. You’d think that the bicycle lobby would be a force to deal with today, judging by all the recreational cyclists on the road. However, when it comes to bike commuting, there’s stagnation (I’m seeing a recent uptick). So long as that’s the status quo, local governments, even those that want to do the right thing and provide bicycle facilities, have a hard time justifying the increased funding or taking away lanes from cars. That’s where SVBC’s efforts are focused. After this meeting I’m beginning to see a sea change in the way bikes are accommodated on the road. It’s no longer the “effective cycling” mantra where bikes mix freely with cars. It’s more like “separate but equal” road sharing with protected bike lanes. That leads to the never-ending debate over why more people don’t bike commute. Is it the result of our streets being too dangerous? That’s the most popular answer and I think it’s true. If we build bicycle-safe streets, will they come? Of course. The good news for cycling is that our freeways are jammed with cars. Google employees in attendance told horror stories about the drive to the Google campus at Shoreline Boulevard and Charleston Road in Mountain View. Cars stack up on Hwy 101 daily. Clearly, commuters are looking for alternatives. What’s encouraging from the day’s proceedings is that government is beginning to act, designing roads with bikes in mind and making accommodations even when it’s politically unpopular. Investing $1 million in a Davis, California, bicycle-safe intersection tells me that people are getting serious about making our streets safer for cyclists. Down the road, I see bicycle commuting rising to as high as 30 percent. It will never overtake the car, especially once the autonomous vehicle comes along, but our streets will be far safer for cycling thanks to this technology and the efforts of the SVBC. That’s all for now. Summit topics I’ll cover include: California state investments, protected bike lanes, local city projects, Vision Zero progress. On an uplifting note, 90 attendees out of 220 rode bikes to the summit held on the Microsoft Mountain View campus. Dave Snyder, Calbike director, addresses the bike summit. This entry was posted on August 12, 2016 at 10:54 am and is filed under Commute Adviser, News. You can follow any responses to this entry through the RSS 2.0 feed. You can leave a response, or trackback from your own site. Biggest barrier to bike commuting in the Bay Area is the fact that everything is so sprawled out (this is partly due to a lack of affordable and higher density housing). My current commute is 6-7 miles one way. That’s considered living close to work but it’s still about 35 minutes on the saddle. After I move in a couple of weeks it will be 18-19 miles one way, or about 80 minutes on the saddle. I think the ideal commute distance via bicycle is <5 miles, but that's nearly impossible due to how the Bay Area is built/developed. Agreed, but that’s changing. I see high-density housing going up all over. Mountain View San Antonio shopping center is one example, next to a rail stop. Yes, best commute distance is about 5 miles. On this subject I would like to let you know about a new organization in Santa Cruz County. The Great Santa Cruz Trail Group. It formed in response to the Counties plan to develop the former Watsonville to Davenport freight line into a rail-trail. The plan is for a trail along side rail road tracks where there is room and diversions to the streets where the right of way is too narrow. It is the opinion of GSCT that it would be far better to have a trail without rail in this corridor. Our County is not appropriate for the development of a transit line here yet and a 32 mile commuter/recreation trail would be a better solution for what to do with this important public resource.